Compact and well-designed, the MVS-3000A production switcher is ideally suited for production studios, stadiums, houses of worship, and OB vehicles requiring multiple inputs in a limited space. The switcher comes with sophisticated capabilities such as 2x mix effects (M/E), 4x keyers per M/E, each with the MVS high-performance chroma key, 2.5D resizers (two keys per M/E only), colour correction, and more. With the standard multi-viewer output, with choice of four, ten or 16 tile layouts, you save space on additional monitoring, enabling a reduction in your total system cost. 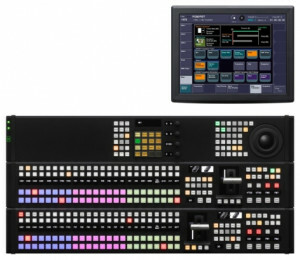 The MVS-3000A switcher offers a choice of control panels. Each panel is designed for easy operation in a fixed configuration. The design is based on the proven CCP style, and experienced operators will feel instantly at home. Additionally, OLED source name displays and RGB colour source buttons are included for optimal visibility and great operability. The MVS-3000A is a two mix effect (M/E) switcher with four keyers on each bus. A variety of background transitions are available to suit any programme requirements and these include ; Mix, Wipe, Non-additive mix, super mix and FM clip. Separate from the main fader, each keyer includes its own auto-transition controls, which allow users to insert or remove keys individually with independent wipes and dissolves. For further flexibility, each keyer also offers chromakeying and colour vector keying, eliminating restrictions of selectable key types. By providing a key priority selection it is possible to give any keyer a higher or lower priority giving operators complete freedom in key selection and which key sits in front of the other in the image plane. Each M/E bus in the MVS system can be configured to operate in multi-program mode. This facility provides four independent outputs on each M/E. Each separate program O/P can be configured with any combination of M/E keyers. In addition to the expanded program O/Ps, clean and key as well as M/E PVW signals are still produced. A powerful resizer function is provided that gives simple 2.5D DME effects for half the keyers in the MVS-3000A. With adjustable parameters such as size, position, and aspect, as well as mosaic and defocus effects, this functionality is very useful for optimizing the on-screen composition. These resizers can also be activated for clip transitions, and the parameters can be memorized as part of a switcher snapshot, keyframe, or macro effect. All these effects can be created without the use of an optional DME, bringing great advantages for both simple operation and minimized system cost. In order to correct for any colour errors in the incoming signals each input has a primary RGB colour corrector. In addition each aux bus output also has an identical colour corrector circuit. This is useful for correcting the colour balance on in-vision monitors. In addition aux mix ability is included which provides a mix transition, rather than a hard cut on aux bus outputs. 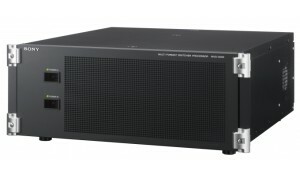 The MVS-3000A provides an internal high-capacity frame store with the ability to handle both individual images (stills) and animation sequences (clips) with embedded audio support . The frame memory system supports eight-channel playback from on-board RAM storage, and images can be imported via USB connection or a real time back up using an external video store. Individual frame memory images or animation sequences can be instantly viewed and recalled via the touch-screen menu operation. The MVS-3000A provides multi-viewer outputs directly from the main processor chassis. This cuts down on the need for expensive external multi-viewers. Each multi-viewer output can be set for four, ten or sixteen split display, and signals are delegated to each separate pane accordingly. The multi-viewer also supports switcher name and border tally indicators. The MVS-3000A features 32 BNC primary inputs and 16 BNC assignable outputs. Using the Flexi-Pad module, you can record operation sequences, then store and assign them to any desired button. Macros are useful in live environments where time is critical and operation errors are not tolerated. In addition to using macros to record complex panel operations, macros can also be used to record menu operations. Macros can be edited either directly from the control panel or with the touch-screen menu display. Once programmed, macros can be executed in several ways: by attaching to the majority of buttons on the control panel surface, recall/run from the Flexi-Pad module, or by trigger on a timeline to execute automatically in a sequence. 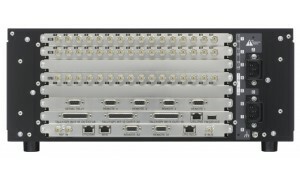 The MVS-3000A switcher can be operated with a single Ethernet-based network. This integrated LAN enables easier connection to devices. The MVS-3000A switcher has integrated device control and so does not require the use of an additional unit, simplifying system installation. Devices can be controlled on the same timeline as switcher events or as part of macro events. When integrating a Sony disk protocol or VDCP-controlled disk recorder, clip management is also provided, allowing different server clips to be recalled and played back as part of a switcher timeline or macro. All MVS switchers provide an intelligent and multi-functional tally system, which seamlessly integrates the switcher and router tally functions. Multiple on-air and recording tallies can easily be programmed on the switcher system, so that even complex tally requirements are accommodated. All MVS family switchers provide clip transition effects that enable transition, together with audio, using a frame memory sequence. During a clip transition, a computer-generated image, such as a logo, moves across the picture from one side to the other, while the transition is performed behind the image. This effect is useful for sports broadcasting. Although highly sophisticated, the effect can be performed with simple settings. Various types of transition such as Mix, Wipe, DME Wipe, and PresetColor Mix can be applied in a background transition according to the motion of the clip. A transition can be operated both backwards and forwards with the fader lever. One convenient feature of MVS switchers is that a format conversion capability can be incorporated by adding an extra format converter board (MKS-6550). This option provides up-conversion and down-conversion between HD (1080i and 720p) and SD (480i and 576i), and cross-conversion between 1080i and 720p at both inputs and outputs. With these capabilities, there is no need for external format conversion. A variety of signal formats can be handled within the switcher system, which minimizes overall system cost. The format convertor can also work in frame delay mode which provides synchronisation and up to 8 frames delay for up to eight input signals. This is useful for remote non-locked sources or for applications involving virtual studios where a compensatory delay is required. The MVS-6500 processor offers the option of two channels of internal digital multi-effects (DME) with installation of the MKS-6570 DME board. This switcher supports brilliant non-linear effects as well as frequently used DME patterns. For example, the following effects can be performed: Digital SPARKLE Effects*, 3D Linear Transformation, Video Modify, Freeze, Light/Trail, Input/Output Effect, Digital SKETCH, Metal, and Glow. 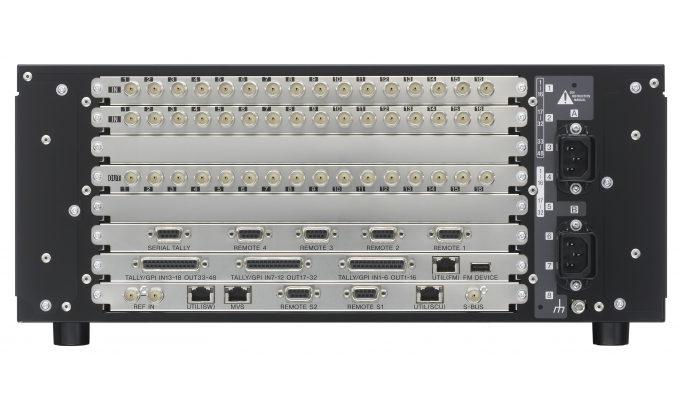 These capabilities ensure the highly affordable MVS-6500 Series is user friendly. * These non-linear effects are supported on a single channel. 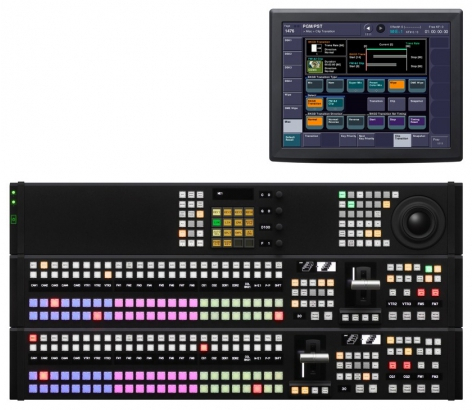 Optional plug-in BZS-8050 Control Software and MKS-8050 and MKS-2050 Editing Keyboards add powerful linear editing capabilities to MVS-6500 Series switchers. BZS-8050 Editing Control Software offers a similar level of functionality to the popular BVE-2000 Editor, along with some key functions available on the BVE-9100 Editor.